Despite many critical voices of the overuse of the Vietnam War metaphor when talking about the war in Afghanistan, there are many striking similarities between the last years of the Vietnam War and the Obama administration’s attempt to extract most US combat forces from Afghanistan within the next twelve months. Recent news from Afghanistan that the Taliban and the Afghan government have started negotiations should be treated with caution. Initial talks may only be the beginning of a long drawn-out negotiation process towards peace, as an examination of the Nixon administration’s effort to win the Vietnam War on the negotiation table and its determination to have, in Nixon’s words, “Peace with Honor” illustrates. The United States will not play as important a role in direct Afghan to Afghan talks that may involve other regional stakeholders (Iran, Pakistan, Tajikistan, Uzbekistan, Turkmenistan etc. ), but ultimately the United States and NATO will cast the decisive vote on Afghanistan’s future by deciding when to withdraw its combat forces and what amounts of foreign aid the Karzai regime will receive in the years to come. Given the upcoming NATO Summit in Lisbon in November and the already looming withdrawal of most NATO combat forces from the region within the next eighteen months, looking at Nixon’s and Kissinger’s attempt to end the war in Vietnam may be worthwhile. 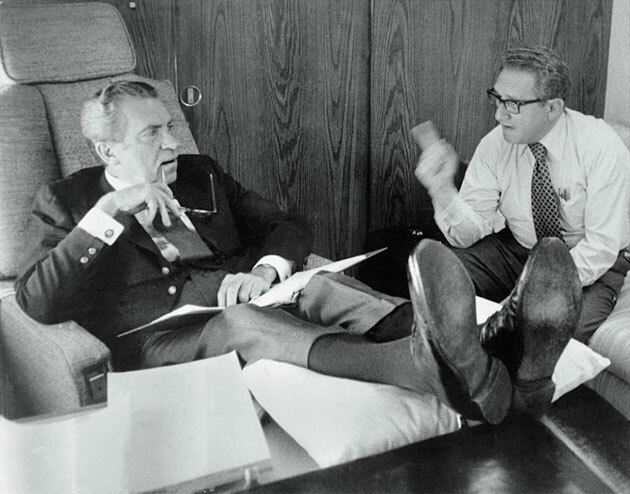 As a historical precedent to President Obama in 2009, Henry Kissinger and Richard Nixon came into the White House in 1969 to end the War that had become a “bone to the nation’s throat”, to quote a former White House speech writer. Talks with the North Vietnamese, begun under the Johnson administration in Paris, were stalled. The main objectives of the United States on the negotiation table were the territorial integrity and independence of South Vietnam, a withdrawal of all US combat troops from South East Asia, and a cessation to communist insurgent activity in the South. Similar to the dilemma of supporting a controversial head of state in Afghanistan today, the Nixon administration reluctantly propped up a largely unpopular leader, Nguyen Van Thie, who was reelected in 1969 after winning a fraudulent election, and whose regime was infamous for its corruption. North Vietnam’s strategy, in a nutshell, was to outlast the Americans, oust the Thieu regime, and take possession of the country once the United States withdrew. Comparable to President Obama’s surge strategy, Nixon decided to increase military pressure on Vietnam. Henry Kissinger insisted that, “A fourth rate power like North Vietnam must have a breaking point.” Upon taking office in 1969, Nixon secretly conveyed to the North Vietnamese that he was seeking peace and willing to negotiate, but that the United States was willing to escalate the conflict should its demands not be met. Nixon’s first attempt to gain concessions from the Vietnamese on the negotiating table failed. Over a period of fifteen months, the United States Air Force dropped more than 100,000 tons of bombs on North Vietnamese sanctuaries in Cambodia. The major stumbling blocks, the integrity of South Vietnam and the preservation of the Thieu regime, obstructed negotiations for the next three years. The ratchet up strategy of current proponents of escalating US engagement in Afghanistan may be unwise. North Vietnam in 1969 shifted from an offensive to a defensive strategy, limiting offensive operations in the South and even withdrawing troops across the demilitarized zone, not due to military setbacks, but to wait Nixon out until public opinion at home would force a US withdrawal of combat troops — something, as sources in Kabul claim, is precisely the Taliban’s strategy. Frustrated by North Vietnam’s unwillingness to make any substantial concessions at the secret negotiations in Paris, Nixon ordered the formation of a secret National Security Council Study Group to come up with “savage punishing blows” for the North Vietnamese. Yet the conclusion of the Study Group, chaired by Henry Kissinger, showed that increased military pressure would not yield additional concessions from Hanoi. The insurgents in Afghanistan, despite being battle weary, will certainly also not be willing to make any major concessions with US troop withdrawal a few months away, despite an increase in drone strikes and special forces operations activities throughout the country. Indeed, we know from the recently instated High Peace Council led by former President Burhanuddin Rabbani that the withdrawal of NATO combat forces is the major Taliban/insurgent condition for any Afghan led peace process. The North Vietnamese, cleverly manipulating US negotiators, essentially bought time by making vague proposals that amounted to little substance, and complaining about procedural matters such as the size and set up of tables at the negotiations in Paris. Their real goal until 1972 was to buy time for North Vietnam to resupply and strengthen their forces for the final military blow against the Thieu regime. The insurgents in Afghanistan, although in no way comparable in size, equipment, and capabilities to the Vietcong and the regular North Vietnamese Army, will probably employ similar delaying tactics until the withdrawal of US led coalition forces. Any initial “willingness” by Taliban and other insurgent leaders to talk has to be seen in this critical light. The famous Vietnamization policy was a direct consequence of the United States’ failed attempt to break the deadlock at the negotiating table with military force and domestic pressure to start withdrawing US combat troops. Without consulting his South Vietnamese ally, Nixon unilaterally announced this policy, frustrated by the lack of military progress and mounting US casualties. Within months, the South Vietnamese Military became one of the largest and best equipped armies in the World (by 1974 South Vietnam’s Air Force was the fourth largest in the world). At the same time the United States stepped up its Phoenix program, headed by the CIA, and — just as its modern successor, the Drone strike campaign, targets insurgent leaders — aimed at decapitating the leadership of the Vietcong and destroying Vietcong strongholds in the South. The United States claimed substantive gains and the elimination of over 20,000 Vietcong cadres in South Vietnam. However, the Vietcong’s command structure and ability to conduct operations remained intact. So far, despite successful hits, the same is largely true for Taliban personnel in Pakistan who have been targets of drone strikes. Indeed, there are also striking similarities between Obama’s decision to step up the drone strikes into Pakistan and Nixon’s controversial decision to invade and bomb Cambodia to buy time for Vietnamization, and destroy North Vietnamese safe havens. At the end, despite having claimed to have killed 2,000 insurgents and substantially disrupted North Vietnamese supply bases and “treasure troves” of intelligence (according to Henry Kissinger), it did not alter the outcome of the conflict, but led to the massive destabilization of Cambodia. Events in Pakistan today illustrate the danger of undermining a government’s authority in their own territory. The strategic military impact of recent drone strikes remains to be seen, but so far have not influenced the Taliban’s offensive capabilities substantially.